Amidst the city of Kuala Lumpur stands the Menara Kuala Lumpur at 515m above sea level. 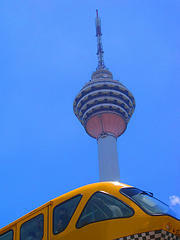 Majestically poised at a breathtaking height of 421 metres, the Tower doubles as Kuala Lumpur's best known ambassador. The four tallest towers in the world are CN Tower in Canada at 553m, Ostankino Tower in Russia at 537m, Shanghai Tower in China at 468m followed by Menara Kuala Lumpur in Malaysia at 421m. Situated atop Bukit Nanas at 94m above sea level, it is on higher ground than the Twin Towers of Kuala Lumpur. Menara Kuala Lumpur was constructed as a telecommunications tower to upgrade the quality of telecommunications and the clarity of broadcast transmissions. Undoubtedly, Menara Kuala Lumpur marks the start of a milestone in the telecommunications arena. Menara Kuala Lumpur ranks fourth amongst the tallest telecommunications towers in the world and was constructed over a period of four years and completed in May 1996. Menara Kuala Lumpur is designed to withstand wind pressures of up to 90mph. 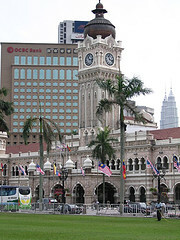 Menara Kuala Lumpur is a member of the prestigious World Federation of Great Towers. Menara Kuala Lumpur is one of the tallest concrete towers in the world, standing at 421m and built with 45,000 cubic metres of sturdy concrete. Designed with vertical ribs on the external surface, the Tower weighs 100,000 tonnes and was built on no-piling, freestanding land. Menara Kuala Lumpur opulently stands as the tallest tower in Southeast Asia.